Ben Fisk has signed with the Candystripes until the end of the season. Fisk in action for Canada. DERRY CITY HAVE launched a mid-season recruitment drive in a bid to strengthen their hand for the second half of the campaign, starting with the acquisition of Canadian international Ben Fisk. The winger, who was most recently with FC Edmonton, arrives at the League of Ireland club on a deal until the end of the 2018 Premier Division campaign after training with Derry for a number of weeks. Fisk was capped by Canada against Bermuda and Scotland in friendly internationals last year and will add ‘quality’ to Derry’s squad, according to manager Kenny Shiels. 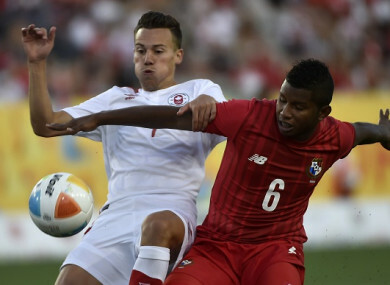 The 25-year-old came up through the youth ranks at the Vancouver Whitecaps and then had spells in Spain with Coruxo and Deportivo B, before he returned home to sign for North American Soccer League outfit FC Edmonton. During two seasons with Edmonton, Fisk made 45 league appearances, scoring three goals. “We’ve been saying for a while that we needed new blood and Ben is the first of our targets to have signed on the dotted line,” Shiels said. Derry sit fifth at the halfway mark of the 2018 League of Ireland season and were this week paired with Dinamo Minsk of Belarus in the Europa League first qualifying round draw. Email “Derry begin mid-season recruitment drive with capture of Canadian international”. Feedback on “Derry begin mid-season recruitment drive with capture of Canadian international”.